The main purpose of your reel is to hold your fly line. Pretty simple right? But your reel does a lot more than that. It keeps pressure on the fish during a "run" and eases retrieval. Again, you want to size your reel with the line and rod weight. This will ensure the correct balance of your rod. Drag – The drag system is one of the most important parts of the reel. 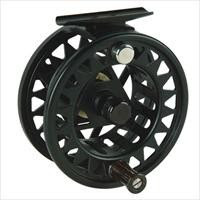 You should look for a reel that has a Teflon (or similar synthetic material) or cork drag system. The drag allows you to keep constant pressure on the fish preventing it from breaking your leader. Drag systems are fairly simple. As you tighten the drag lever, the spool is compressed on either cork or Teflon increasing the friction or pressure. Some reels have no drag system at all. The fisherman applies pressure with his hand to control the drag. Saltwater Proof – If you are going to be fishing in saltwater, you should definitely purchase a reel that is sealed from the saltwater. This will increase the cost but it is necessary. A word of caution. An expensive reel does not mean it is saltwater proof.